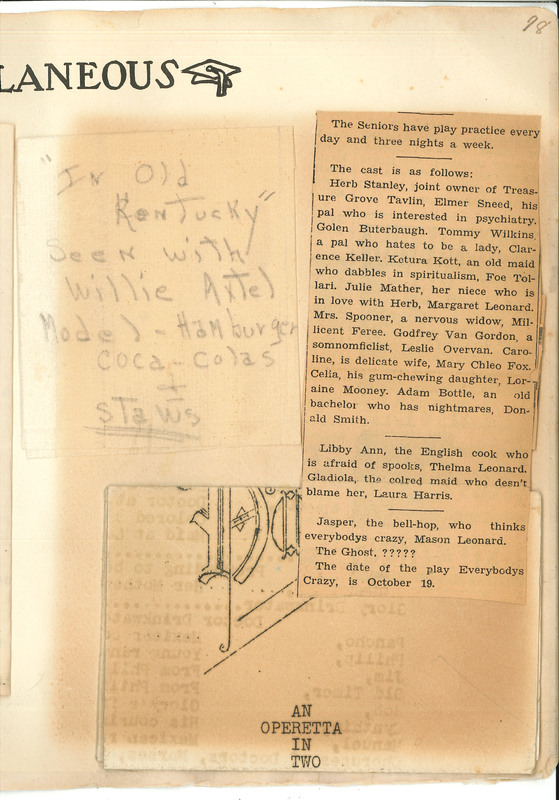 98 "In Old Kentucky" seen with Willie Axtel Model - Hamburger coca-colas & staws The Seniors have play practice every day and three nights a week. The cast is as follows: Herb Stanley, joint owner of Treasure Grove Tavling, Elmer Sneed, his pal who is interested in psychiatry. Golen Buterbaugh. Tommy Wilkins, a pal who hates to be a lady, Clarence Keller. Ketura Kott, an old maid who dabbles in spiritualism, Foe Tolari. Julie Mather, her niece who is in love with Herb, Margaret Leonard. Mrs. Spooner, a nervous widow, Milicent Feree. Godfrey Van Gordon, a somnomficlist, Leslie Overvan. Caroline, is delicate wife, Mary Chleo Fox. Celia, his gum-chewing daughter, Loraine Mooney. Adam Bottle, an old bachelor who has nightmares, Donald Smith. Libby Ann, the English cook who is afraid of spooks, Thelma Leonard. Gladiola, the colred maid who desn't blame her, Laura Harris. Jasper, the bell-hop, who thinks everybodys crazy, Mason Leonard. The Ghost.